Oh, boy! WuzOne is up to his old tricks of putting his new spin on a classic. Much like many before him, and likely many after him, Wuz has taken Mickey’s gloved hands and turned it into a custom Kidrobot 3inch Dunny along with a coinciding print too. Limited to 7 pieces, Mickey Messy Dunny will come shipped with its own special Mickey Messy A4 print. Priced at $99 (£78) for both the 3inch custom Dunny and the Print is a nice deal. You will be able to purchase Mickey Messy Dunny at 11pm GMT on Thursday 29th November over on the WuzOne store HERE. The print is limited to 37, with the remaining 30 prints available to purchase for $35 (£) HERE. 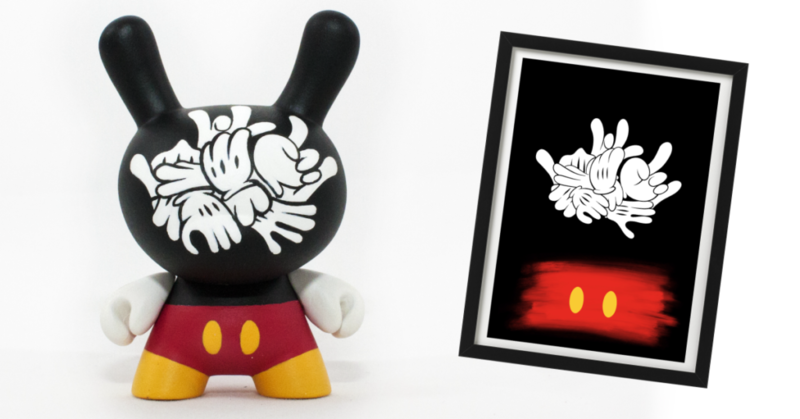 Both the custom Mickey Messy Dunny & the print includes FREE worldwide shipping in the price. There is also an A3 version of the print, which can be purchased HERE for $45 (£35), again with FREE worldwide shipping included. Limited to 30 pieces and printed on 350grs paper. Follow @thewuz on Instagram for more WuzOne custom pieces!